I chose to go to La Casa Del Rey for the first time about a week ago because I met one of the owner's family members and I liked the story he told me: a quarter century in existence growing from a dream to a small four-table operation to a busy and successful Commerce City standard. All the while run by the same family from our own San Luis Valley, literally going back almost 100 years to take pages from grandma's old recipe book. Oh, and I am always up for something new and I have to admit that I have never once been to a restaurant in Commerce City. Or for that matter written the words: "Commerce City Standard". CC (not to be confused with the Chocolate City-- which would be hard) is thought of by most Denverites as a commercial and industrial wasteland, and not without reason; but at the same time it is full of working-class families and pockets of communities that are the basis for forming good neighborhood restaurants. I was hoping La Casa Del Rey would be one of them. There are mixed signs to be found when one is considering eating his first meal at the House of the King. Consider the withered banana (pepper I suppose) that appears to be coming off a sleepless three-day bender and thought that by putting on a ton of make-up she would be able to show up at work and no one would notice. Little did she know that was the day La Casa decided to take her picture and emblazen it on eveything from the website, the servers, the menus and even t-shirts for little babies. Mrs. Cha Cha, as she is known, reminds me of an old lady who spent one too many years sunning by the pool in Florida. And trust me, you don't want this picture on your chest. Or your menu. On the other hand, the fact that La Casa embraces this pepper so much makes it somehow funny and OK. And they keep with the preferred way of spelling "chile" which I take as a tremendously great sign. Plus the rest of the back story of this restaurant as it was told to me included the fact that just about everything at La Casa Del Rey is made from scratch in-house: from the beans and tortilla chips to the shredded beef and chile rellenos. And again, many of these are good old-fashioned Southern Colorado recipes. This is about as Colorado as it gets. And this is why, as promised in my last post, I was bringing my Mexican in-laws out to dinner at a Mexican restaurant. But of course this is not a Mexican restaurant in a pure sense, and as I have dedicated many lines of prose to the differences between Mexican food and New Mexican-- or food from Southern Colorado (remember it was all Mexico about 150 years ago)-- I won't bore you again on the differences. Suffice to say I was bringing my in-laws here to taste the distinct flavors of Coloradan fare that developed just like another region of Mexico-- though with the technicality that it was now in the US. La Casa Del Rey is an adobe structure just off Quebec on 72nd in the heart of Commerce City. Inside it is wildly decorated with tropical faux palm-leaf ceiling fans, wooden parrots, southwestern prints and utilitarian booths and tables. None of these are particularly good signs for me either, and I doubted myself for a second for bringing my in-laws here for their first true Southwestern food experience. 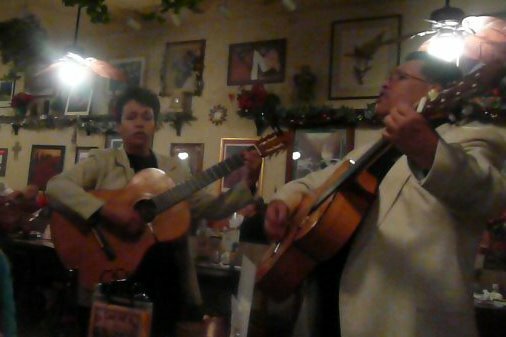 We sat down while being serenaded by the sounds of a guitar duo. This was a nice touch, and they quickly warmed to my family and even belted out some obscure requests form my mother in-law while we sipped our drinks. I also immediately ordered us a big plate of green chile, and for the first time my inlaws brought a spoonful of green chile to their mouths. I have to say that it was a very good green chile, cooked the way I like it with big chunks of red tomatoes and chiles, just a little thick but mostly soupy, just the right amount of spice in the hot version and all with a casera (homemade) taste and comfort. We all liked it very much and I breathed a sigh of relief that my inlaw's first green chile was this good. While we savored our green chile, we browsed the extensive menu and I decided on the enchiladas with shredded beef--smothered, of course, in green chile. The house-prepared, hand-shredded beef was indeed moist and rich with flavor. Topped with the green chile and mixed in with the thick refried beans, it was an excellent plate of enchiladas. My wife ordered the chiles rellenos, which quickly became the talk of our table. Unlike its Mexican counterpart, traditional chiles rellenos in these parts are made with the long New Mexican green chile instead of the shorter and stouter Mexican poblano. I don't know if my mother-in-law ever quite believed that her daughter was eating chiles rellenos, but she did agree that, whatever it was, it was really good. The batter was thick and fried crisp, the chile fresh and the cheese melted in with the smothered green chile sauce. My father-in-law had an excellent plate of Steak Ranchero: sliced strips of steak covered in a sweet and spicy tomato and chile sauce. It reminded him of Puntas de Res a la Mexicana, which is another, very similar dish of beef tips covered in a red sauce all mixed in with sauteed peppers and onions. Whatever it was, there was an enormous plate of it and we all got to try a healthy share of it. My mother and sister-in-law had relatively unremarkable plates of carne asada and a carne asada burrito, respectively. Although, to be fair, my sister-in-law ordered her burrito without the green chile, which is a lot like getting a slice of pizza without cheese or sauce, but being fifteen, she is a little less-than-adventurous and in the end really did like her meal. Here is what her burrito contents looked like on a small tortilla (flour of course) with a nice helping of green chile and beans. Now that was good. We finished it off with a round of sopapillas. Just like the chile relleno plate, my family gave me a confused look when a plate of five fluffy pieces of plain-looking dough came out for our dessert. For some reason I am not a huge fan of the sopapilla, although I do recognize that fried dough drizzled in honey is generally a good thing. These were good sopapillas, and got the nod of approval from the in-laws by being devoured in a matter of minutes. Regardless of what the signs were for La Casa Del Rey, in the end it was a great meal with friendly service and fun entertainment. While the kitschy and dated interior decor reflects the 25 years this restaurant has been up and running, the food reflects a family that still cares about its patrons by turning out quality plates served by a friendly and efficient staff. Yes, La Casa del Rey is exactly the type of neighborhood restaurant that I hoped to find in CC, and is a comforting taste of Grandma's home-style Southern Colorado cooking perfected after generations of practice. What do Joe Biden, Dog the Bounty Hunter and a young John Elway all have in common? 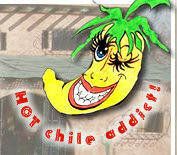 They all have been to La Casa de Rey over the years and had their mugs added to the walls and website of La Casa. See if you too can join this elite crowd by visiting La Casa in our industrious neighbor to the north and eating a plate of their excellent green chile.